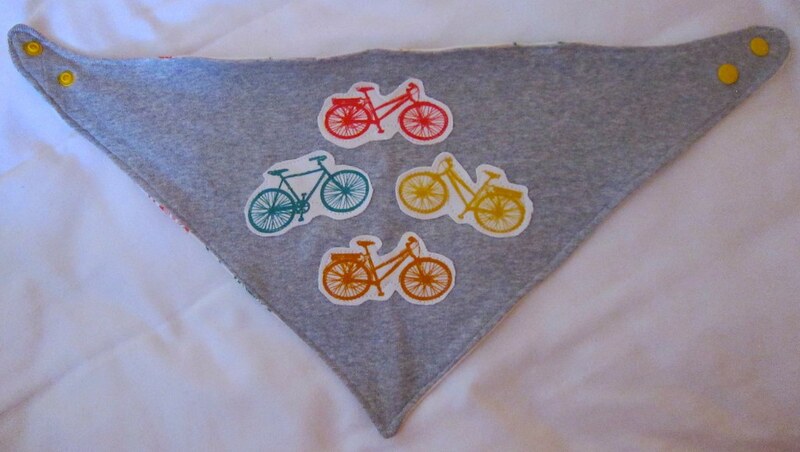 Somehow, despite having a 10-week-old and a four-year-old I actually SEWED something. Three somethings in fact! So I am very glad that Cindy, Clio and I decided to do a little Small Human Being Sew-Along this month, as it has given me the extra kick I needed to push on through the sleep deprivation and squeeze in time at the sewing machine again. (Not that giving birth to and parenting a small human being isn't in itself creative, but I thrive on MAKING and SEWING and DRAWING and KNITTING). This outfit isn't quite as geeky as say, Cindy's AMAZING Hobbit outfit for her baby boy, but it still makes me super happy. 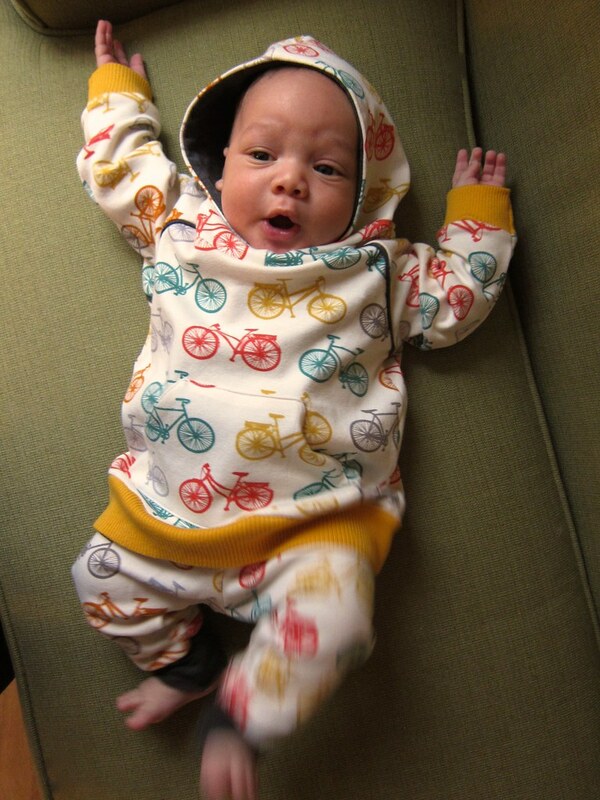 I am a sucker for baby hooded jackets and bicycles, not to mention bicycle-themed baby jackets. So: fun all around! Pattern: The sweatshirt is the free raglan hoodie pattern from Brindille & Twig, a new-to-me pattern company with lots of great modern designs for baby and toddler knitwear (found via So Zo). Fabric: About 2/3 of a yard of bicycle-print organic cotton interlock from Birch Fabrics ("Just For Fun Bike It Multi") purchased at my fantastic neighborhood sewing/knitting shop, Brooklyn General (but out of stock at the moment on Fabric.com), plus golden yellow rib-knit from Sew Baby and some thin gray soft cotton lycra knit from my mom's stash. 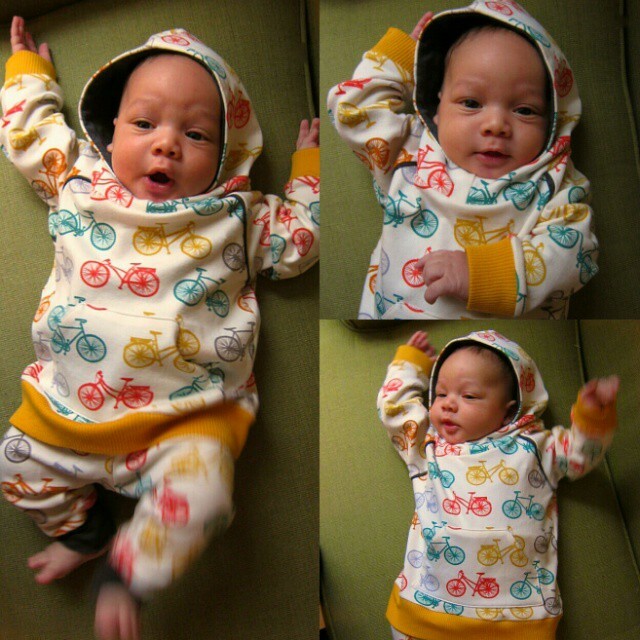 Size: I agonized over this, but since he already had two me-made hoodies in size 3-6 months, I went for the 9-12 month size. It's way too big, but totally wearable for my big two-month-old guy — and he'll grow into it. Pattern thoughts: I love the style of the hoodie—something about the shaping, especially of the hood and neckline, just feels very clean and modern to me. And I'm a sucker for piping, even if mine came out a bit wobbly (flat knit piping always seems to stretch on me!) It was also fun to make a pull-over hoodie—no snaps or zippers required this time! The lined hood is a nice touch, and the ribbed cuffs and waistband mean NO HEMMING. Instructions: The photo instructions were very clear and helpful, but I do have one small quibble — there weren't a lot of notches on the pattern for matching up pieces, so I added my own. Modifications: I made the piping 1/8" wider than directed, as I was afraid it would disappear into the seam allowance, and I'm glad I did (So Zo also mentioned this was an issue). Construction notes: I made this all on the sewing machine, as I was visiting my mom and she doesn't have a serger—I just used one of those stretchy fake overlock stitches on her Husqvarna Viking so any interior seams would look neat. 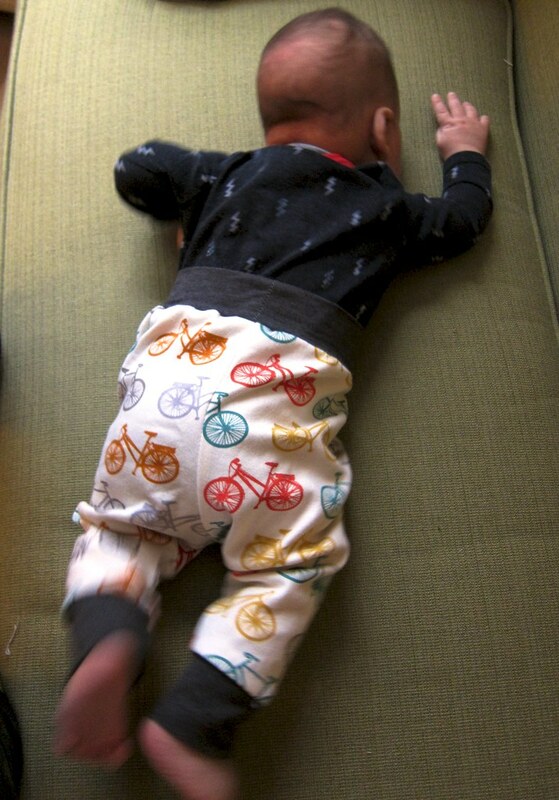 How I found the time: I was visiting my parents and would sneak away to the sewing machine at night once baby was asleep in the portable crib. I even got some daytime cutting and sewing in while baby was sleeping in the swing (oh how I wish it fit in our apartment! 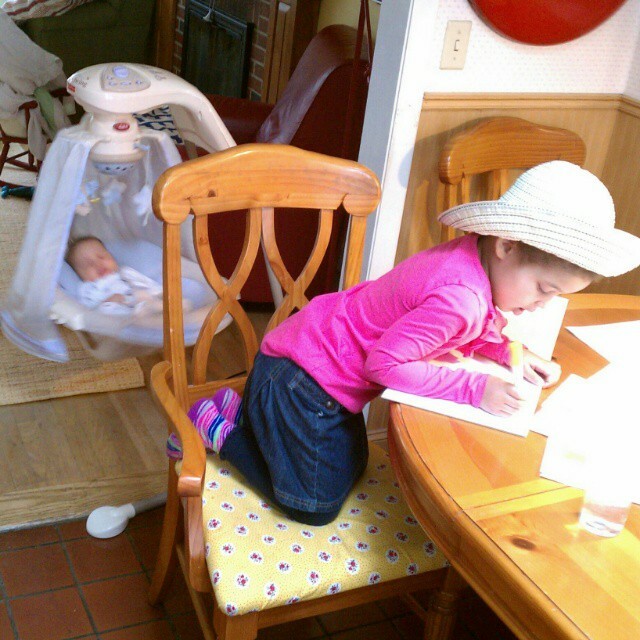 lately he only naps in a carrier at our place) and big girl was drawing or playing with her grandparents. 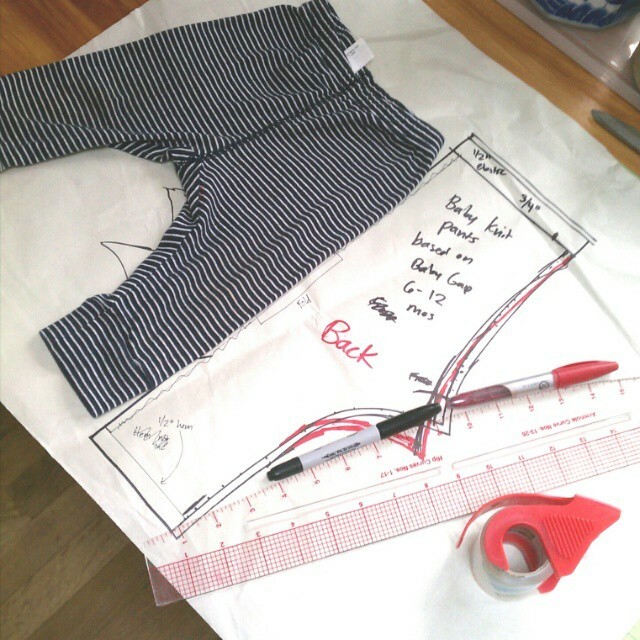 For the little knit pants/trousers, I just traced a pattern from a pair of Baby Gap jersey knit pants in size 6-12 months (I had accidentally left my entire stash of Ottobre magazines in Brooklyn!) It's just one pattern piece, but it's not symmetrical—the back is lower than the front for diaper room.
. I decided to go for cuffed legs for laziness/cuteness, and a doubled knit waistband with no elastic (the jersey has some lycra, so it's sort of a yoga pants effect, very comfortable). I think the little dude likes them! Again, too big: but he'll grow into them. Next time I may shorten the rise and deepen the waistband bit. 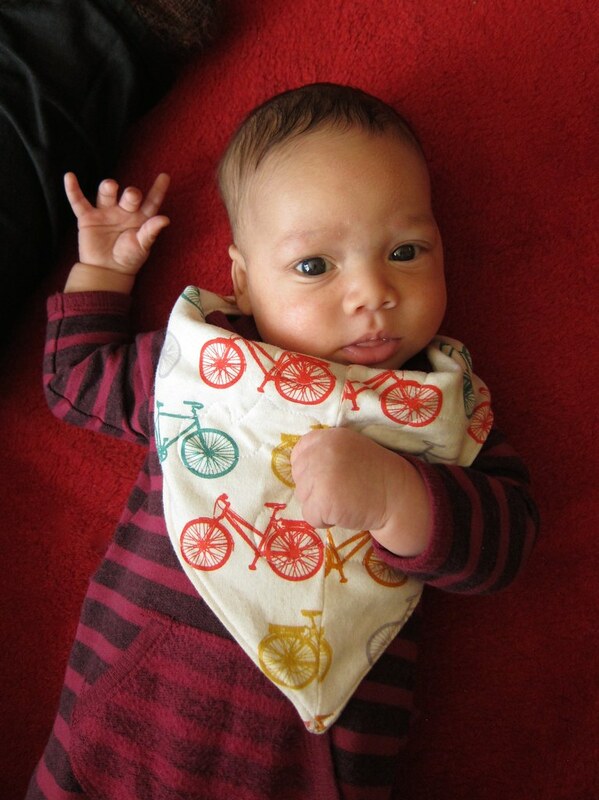 Oh, and the fabric was way too expensive and cute to waste the scraps, so I pieced together a little reversible appliquéd handkerchief bib from the scraps (I just traced a bib a friend sewed for him, but there are loads of free patterns online) with yellow snaps. So that's what I've finished so far. I'm also halfway through a (barely) wearable muslin nursing hack of the Jalie scarf-collar top, but I think I need to go pass out now before baby wakes up hungry again. Also, a question: do my posts lately seem more disjointed/ungrammatical than usual? I can't help fighting this feeling that I am so tired I am not speaking/typing with any true coherence! So... sorry about that. If it is actually true. Or maybe not sorry? 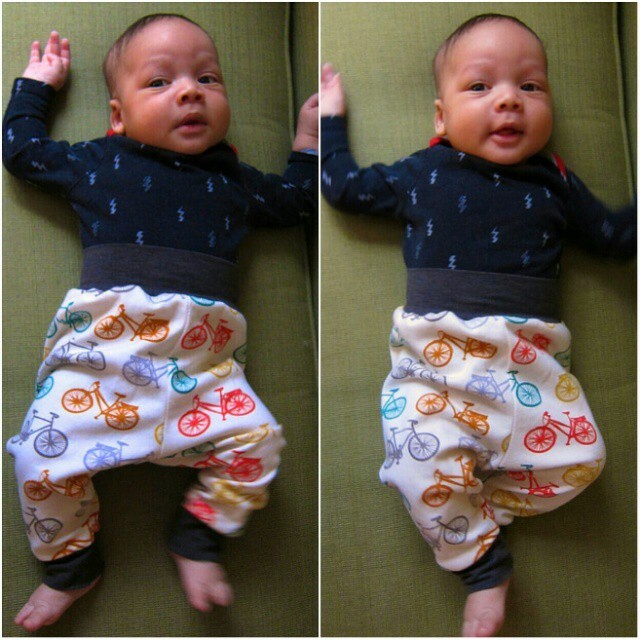 Cation Designs: Introducing the Small Human Being Sew-Along! B is for Baby, S is for Sew-Along!" 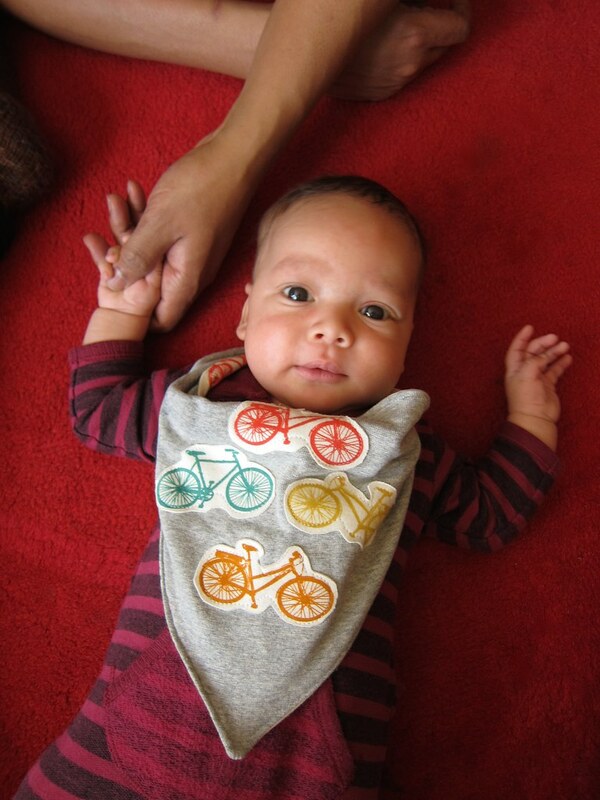 The Small Human Being Sew-Along: Sewing Stuff for Babies and Parents. Join Us! (that's the post with the badges you can grab, by the way). I did not know that that hoodie pattern existed! Thanks for the heads-up, and I'm going to have to check it out after I finish my current projects. 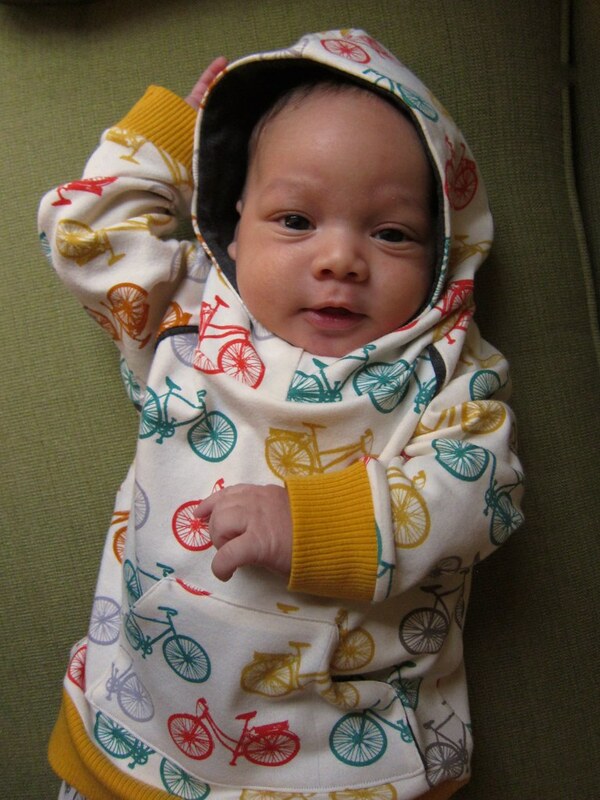 Excellent use of every scrap of bike print...baby D looks so good! I didn't notice anything different in your coherence in this post, but then I feel like the same thing is happening to me. :P I keep stumbling over my words in class and I feel like my students are wondering what happened to their teacher! This is SOOOOO CUUUUUTE!!! 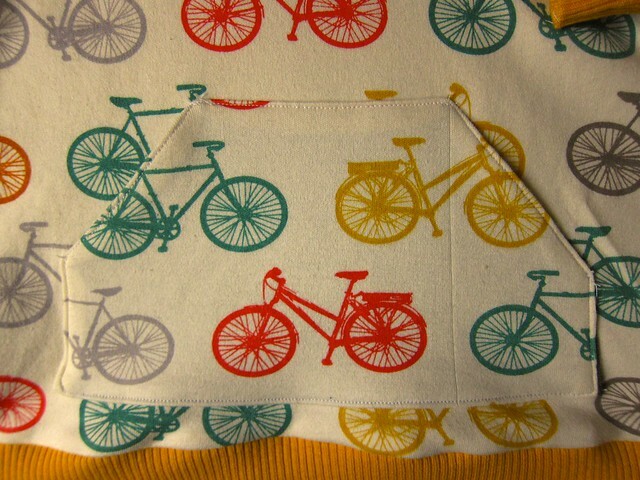 I'm always partial to bicycle prints and I just LOVE the colors in this outfit. Your little man is so adorable. I'm going to have to make a hoodie and leggings one of these days; don't be offended if I completely copy yours! Oh my gosh, he is SO CUTE. 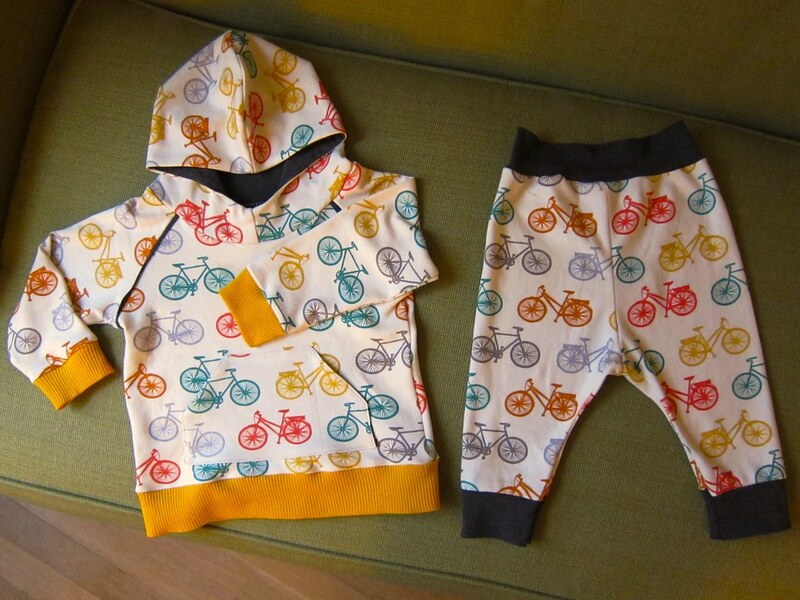 This outfit is awesome and perfect for your bicycle-loving family!! !